Government contracts have been mother’s milk for space companies, but the milk has run low and those companies are crying from hunger. COM DEV International (COM DEV) CEO Mike Pley at COM DEV HQ in Waterloo on May 29th. As outlined in the May 29th, 2015 The Record article, "Com Dev gets funding for space junk tracking project," Pley was on hand for the Federal government announcement that his firm had just received $3.2Mln CDN from the Canadian Space Agency's (CSA) Space Technology Development Program (STDP). Of course, the 1,200 employees worldwide who work for the company don't depend on government contracts to make ends meet. As outlined in the April 16th, 2012 post, "ComDev Learns from its History," the company made a strategic decision in 2010 to move away from its reliance on government contracts after then COM DEV CEO John Keating was fired for suggesting publicly that COM DEV revenue shortfalls were caused by delays in government funding of the RADARSAT Constellation program. Photo c/o Peter Lee/ Record staff. United Launch Alliance (ULA) of Bethesda, MD is feeling the hunger pangs. So is MacDonald, Dettwiler (MDA) of Richmond, BC. And it’s even worse for the little comrades in Russia. 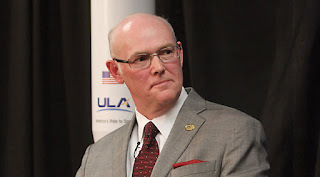 In a May 22, 2015 article at Via Satellite “ULA Eager to Tap Commercial Market with Vulcan Rocket,” ULA president Salvatore “Tory” Bruno said his company must find more commercial customers to survive. Tory Bruno looking grim. Photo c/o Space News/Tom Kimmell. Not just to do OK—to survive. Bruno thinks ULA might only get two or three government launches a year. For all its worth, at least according to the May 30th, 2015 LA Times article, "Elon Musk's growing empire is fueled by $4.9 billion in government subsidies," even SpaceX is the supposed beneficiary of at least some government largess. In Canada, MDA has repeatedly said they have to find customers outside of Canada because Canadian government business is drying up, a situation most recently covered in the May 12th, 2015 post, "MacDonald Dettwiler, Sherlock Holmes and Why "Daddy" Might not Love Either." The irony is MDA bought an American company, Space Systems Loral (SSL), in 2012 to offset this problem. The US government’s recent cutbacks on space contracts have left MDA, just like ULA, scrambling for more commercial business. Colicky MDA CEO Dan Friedmann. Photo c/o MDA. Government contracts haven’t dried up completely. MDA continues to receive maintenance contracts for the Mobile Servicing System on the International Space Station (ISS). 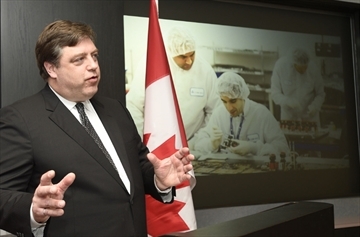 And, as outlined in the May 29th, 2015 Federal government press release, "Supporting Canadian Research and Innovation in Space Technology," MDA was also listed among the 21 high-tech companies which received research and development (R&D) funding via the Canadian Space Agency (CSA) Space Technology Development Program (STDP), last Friday. According to the press release, MDA will receive five awards of $200,000 - $500,000 CDN for a variety of projects. But maintenance contracts and small research awards won't keep a hungry, $2Bln CDN space company satisfied for long. They need new projects. The only new Canadian government project on the horizon is the Polar Communication and Weather (PCW) mission. As outlined in the February 24th, 2014 post on a “Team Canada Solution for PCW Mission Competing Against US Bid,” PCW consists of two communications satellites that will monitor the high Canadian Arctic. A consortium of three Canadian companies—Telesat, COM DEV, and MDA—is bidding on it. They’re facing stiff competition from American companies like Lockheed Martin of Bethesda, MD. How critical is it for the consortium to get this contract? This is the only big Canadian government space project in the works right now. Nothing else is planned for the next few years. According to Tatyana Golikova, the head of Russia's Audit Chamber, Russian auditors have uncovered 92Bln rubles ($2.9Bln CDN or 1.8Bln Euros) in financial violations committed by federal space agency Roscosmos last year. Photo c/o Maxim Stulov / Vedomosti. So how do the Russians fit into the scenario? On the surface they don’t because the Russian government has been pumping money into their space industry for a few years now. Or so it seemed. The May 24, 2015 Moscow Times article, “Audit Reveals $1.8 Billion Financial Violations at Russia's Space Agency,” outlines corruption in Roscosmos, the Russian space agency. Other officials, including the prime contractor for Russia’s new spaceport at Vostochny, have also been caught dipping their beaks in the milk. The unfinished Vostochny Cosmodrome. 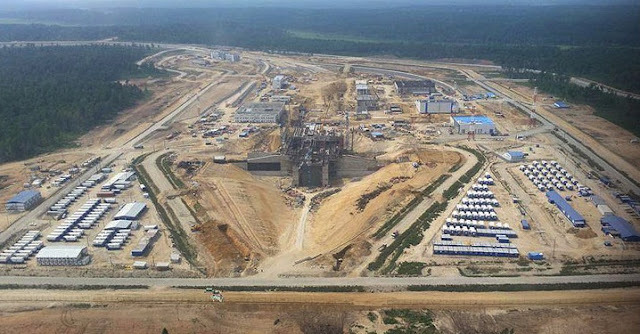 As outlined in the April 14th, 2015 Global Construction Review article, "Russian spaceport workers go on hunger strike over unpaid wages," the cosmodrome construction has been hit by delays and arrests over embezzlement, just weeks after deputy prime minister Dimitry Rogozin approved an extra 32Bln rubles ($720Mln CDN) to speed up construction. According to the article, Russian president Vladimir Putin is pouring more money into Vostochny in an attempt to keep the work on schedule. Yes, the money is flowing like salts through a goose, but you know what comes out of the goose. 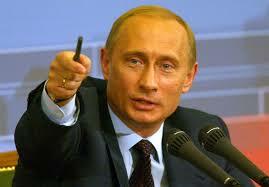 Russian president Putin pointing fingers. Photo c/o Wikipedia. The Russian space industry isn’t getting the money and they’re in the same boat as their North American cousins. Unlike their cousins, though, the Russians are likely going to lose commercial market share because their rockets have been blowing up a lot lately. The good news is that government spending is expected to grow. “Euroconsult—Moderate Growth Projected For Government Space Programs (Analysis | Report)” a July 10, 2014 article at Satnews, references a report released in July 2014 by Euroconsult, a global consulting firm. According to Euroconsult, the recent dip in government spending will recover as we enter a new growth cycle. However, even with more money available, there’s no guarantee that governments will fund new space projects. And with a federal election coming this fall in Canada, who knows what will happen to funding here. The day when a space company’s business plan could be built on a steady stream of government work alone is gone. 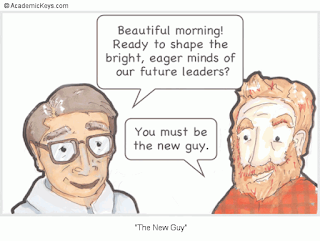 You’d better be diversified if you want to be in the game for the long haul. It’s enough to make a space company president spit up. It's mostly focused on the larger "aero" component of the aerospace industry this year, but the 67th Canadian Aeronautics and Space Institute (CASI) AERO Conference and Annual General Meeting did manage to take some time out from its busy three day schedule to honour Canadians contributing to the conquest of our final frontier. Major Paul Maskell, the current DND Sapphire project manager with MDA principal engineer Robert Leitch and DND systems engineer Farid Aziz. 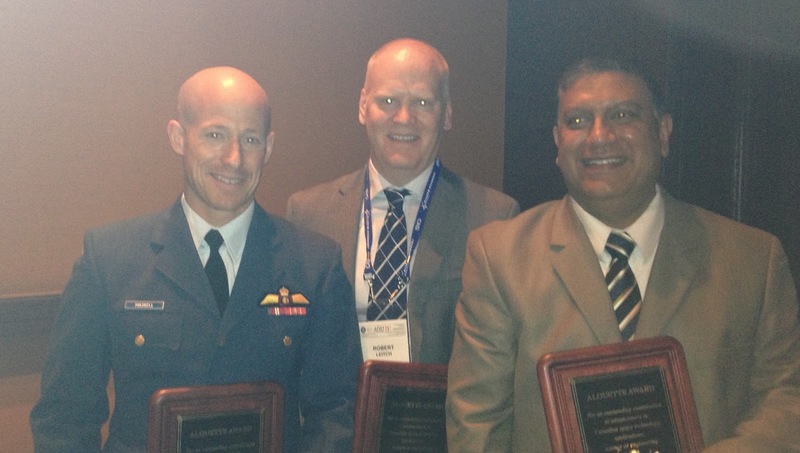 The three accepted the 2015 Alouette Award on behalf of the DND and MDA Sapphire project teams at the 2015 CASI Senior Awards banquet. Photo c/o author. The Alouette Award, which was presented to both the Department of National Defence's (DND) Surveillance of Space (Sapphire) project team along with the MacDonald Dettwiler (MDA) Sapphire project team, for successfully working together to deliver the satellite to the Canadian Armed Forces. The award recognizes outstanding contribution to advancement in Canadian space technology, applications, science or engineering and is awarded annually for outstanding achievement in the field of astronautics. Sapphire, Canada's first military satellite, is a small spacecraft designed to monitor space debris and satellites within an orbit 3,728 to 24,855 miles (6,000 to 40,000 kilometres) above Earth. As outlined in the January 30th, 2014 MDA press release, "MDA announces Canada's DND Sapphire satellite completes commissioning and has transitioned into operations," the satellite has been providing data to the United States Space Surveillance Network since January 2014. 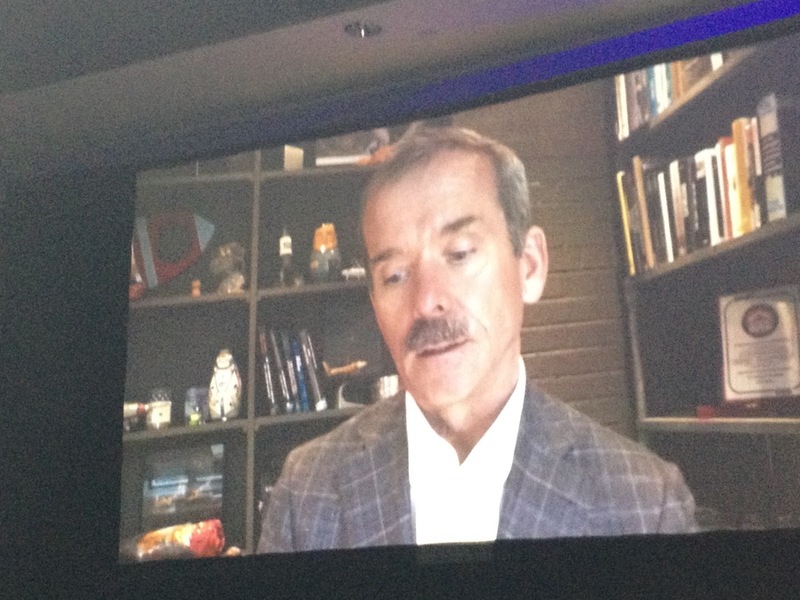 Chris Hadfield checks in via skype during the the 2015 CASI Senior Awards banquet. Photo c/o author. The Trans‐Canada (McKee) Trophy, which was presented to retired Canadian Space Agency (CSA) astronaut Chris Hadfield for representing "the true spirit of exploration and discovery." during his distinguished career as a fighter pilot, astronaut and as the first Canadian commander of the International Space Station (ISS). Hadfield, raised on a farm in southern Ontario and inspired as a child while watching the Apollo 11 Moon landing on TV, was the first Canadian to walk in space and is officially a civilian astronaut, since he retired as a colonel from the Canadian Armed Forces in 2003 after 25 years of military service. The trophy, established in 1927, is Canada's oldest aviation trophy. It was created by Captain J. Dalzell McKee, an American citizen and pilot, who flew from Montreal to Vancouver that year and was so impressed by the services provided by the Royal Canadian Air Force (RCAF) and the Ontario Provincial Air Service that he established the endowment to promote Canadian aviation which, unofficially at least, still bears his name. 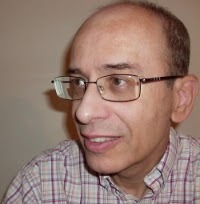 JM Floryan. Photo c/o UWO. The McCurdy Award, which commemorates the many engineering and other contributions made by John Alexander Douglas McCurdy during the early years of aviation, was presented to Professor Jerzy Maciej Floryan from the University of Western Ontario for his contributions in the area of hydrodynamic stability, flow control and interfacial fluid mechanics. The C.D. Howe Award, presented for achievements in the fields of planning, policy making, and overall leadership in the aerospace industry was presented to the Honourable David Emerson for his contributions as head of the 2012 Aerospace Review. The Roméo Vachon Award, presented for outstanding display of initiative, ingenuity and practical skills in the solution of a particularly challenging problem in Canadian aeronautics and space activities, was presented to Stephan Werlen, for his contributions at the National Research Council of Canada in support of the Pratt & Whitney Canada altitude test cell, icing cell, high pressure compressor rotors (HPCR) and wind tunnels. The event, held this year in collaboration with the Green Aviation Research and Development Network (GARDN) in Montreal from May 19th - 21st, focused on a variety of "green initiatives" to reduce the carbon footprint of the aerospace industry. CASI bills itself as a nonprofit technical organization for aeronautics, space and remote sensing. It hosts a variety of events, including the recently concluded 65th International Astronautics Congress (IAC), which was held in Toronto from September 29th - October 3rd, 2014 and the bi-annual CASI Aero and CASI Astro conferences. The next CASI ASTRO will be held in May 2016. Stay tuned. 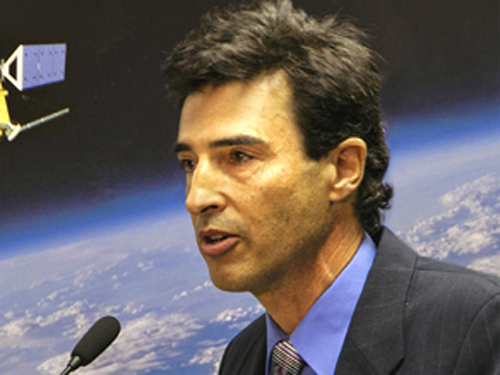 Commercial space activities are often a collaboration between academics, business and government organizations. With that in mind, here's a preliminary list of government agencies you need to know if you plan on building a Canadian based space company. CSA programs are often funded only partially through the CSA, but instead depend on funds from other areas, such as other Industry Canada departments, academic institutions and the private sector. The current chief executive officer of the CSA is president Sylvain Laporte, who reports directly to the Minister of Industry. And sometimes that's even the way it works. But not always and not often in Canada. Essentially, the DND has a 45 year bipartisan history of being consistently starved for funding from the Federal government, which has forced it to borrow a variety of tactical assets for specific missions from other (mostly American) partners, much to the detriment of Canadian based programs and our international reputation. For example, the first annual Defence Acquisition Guide, released to moderate applause on June 16th, 2014, was an almost totally unfunded, $100Bln CDN wish list of DND pet projects (included several military-related space projects totaling some $5.9Bln CDN) which will likely soon join the $490Bln CDN Canada First Defence Strategy, another unfunded 2008 military program which eventually crashed against the shore of harsh government austerity. Industry Canada (IC) – The Canadian government department charged with fostering a growing, competitive, knowledge-based Canadian economy. The head of the CSA reports directly to the head of IC and both agencies are governed by a variety of existing IC policies on science and technology such as the Mobilizing Science and Technology to Canada’s Advantage Report (May 2007) and the Mobilizing Science and Technology to Canada’s Advantage Progress Report (June 2009). IC also manages the National Research Council (NRC) and various other organizations relating to science and technology. The NRC reports to Industry Canada (IC), which tends to focus Canadian spending in this area around questions of commercialization, rather than basic research. MP Aspin on May 22nd. Photo c/o Nugget.ca. It's scheduled for October 8th - 10th, just days before the expected Canadian general election on October 19th, and will occur in the Nipissing-Timiskaming riding of conservative MP Jay Aspin, who is not only the chair of the parliamentary space caucus but also the vice-chair of the parliamentary aerospace caucus. Aspin even announced the event. North Bay, Ontario will mark World Space Week, a fall event which normally focuses more on the scientific and educational benefits surrounding space exploration, by hosting a local three-day event aimed at helping to promote the city's recent efforts to attract aviation, aerospace and space industries. As outlined in the May 22nd North Bay Nugget story, "City to mark World Space Week," the event will include, "an industry day featuring presentations, keynote speakers, business-to-business sessions and tours for aerospace and space-related companies. There will also be an education day aimed at promoting space and aerospace themes to local students through static displays, hands-on experiments and activities such as sun-gazing and geocaching." 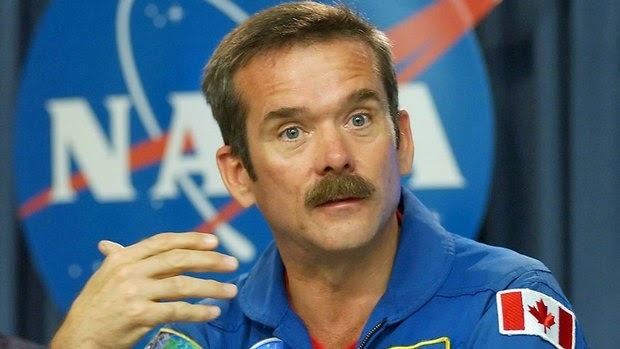 According to the article, retired Canadian astronaut Chris Hadfield is also expected to attend. Then astronaut Chris Hadfield attempting a look of political caginess in 2006. Photo c/o CBC. As outlined in the June 30th, 2014 post, "Canadore College Testing New European Space Plane Design," the college entered into a partnership with European based Swiss Space Systems (S3) to test the SOAR suborbital space plane at Jack Garland Airport in North Bay in 2014. Astronomers Without Borders, an organization which "brings the world together to share our passion of astronomy and the wonders of the Universe." The International Astronautical Federation, which brought the 65th International Astronautical Congress to Toronto, Ontario in September 2014. Universe Awareness, an International Astronomical Union and United Nations Educational, Scientific and Cultural Organization (UNESCO) endorsed educational organization. The Space Generation Advisory Council, which focuses on the "international, national and local level to link together university students and young professionals to think creatively about international space policy issues and inject the new generation point of view into international space policy creation." Yuri's Night, an annual world space party which celebrates the first orbital flight of cosmonaut Yuri Gagarin in 1961. There is, of course, no doubt that MP Aspin is also hoping that this event takes off. As outlined in the November 30th, 2014 post, "Ambitious MP Announces Canadian "Space Caucus" Focused on the Economics and Business of Space," the busy politician, still officially a "back-bencher" in the current Stephen Harper government, almost certainly hopes to win re-election by more than the eighteen vote margin he enjoyed in the 2011 election. Over the past week, three small companies working to commercialize alternative forms of fusion power have received significant new funding from both government and private sources. This influx of funding will allow these innovative firms to press forward with this world-changing technology. Michel Laberge, from General Fusion discusses the prototype fusion reactor his team is working on during a presentation at TED 2014. To see full presentation please click on this link. Video c/o TED 2014. According to a May 19th, 2015 BC Business article, "Malaysia takes a $27-million liking to BC's General Fusion," Malaysia's sovereign wealth fund, the Khazanah Nasional Berhad, has announced a $27Mln CDN investment in General Fusion of Burnaby, BC. The Malaysian group joins existing investors in General Fusion including Cenovus Energy, the Business Development Bank of Canada (BDC) and Bezos Expeditions (the personal venture capital fund of Amazon.com founder Jeff Bezos). The funds will go towards commercializing the company's magnetized target fusion (MTF) technology. In MTF, a metal sphere filled with molten lead-lithium is filled with hydrogen gas heated until it becomes a plasma, which is then compressed by shock waves made from 300 computer-controlled pistons striking the outer wall of the sphere, triggering nuclear fusion. General Fusion has raised over $100Mln CDN to date and plans to begin building a full scale prototype in 2017. On May 15th, the US Advanced Research Projects Agency-Energy (ARPA-E) announced it was providing $60Mln USD ($72 Mln CDN) in funding for various energy-related projects. One of the recipients is Seattle, WA based Helion Energy. Another company researching the same area, Middlesex, NJ based LPP Fusion, has also received $200,000 USD ($246,000 CDN) in funds from the Baltimore, MD-based Abell Foundation. Helion Energy, which also received $3.9 million USD ($4.8Mln CDN) from ARPA-E and smaller amounts from start-up funder Y-Combinator and Mithrel, is developing a technology called magneto-inertial fusion (MIF). MIF uses magnetic fields to both heat and compress a plasma, triggering nuclear fusion and researchers claim to be able to generate fusion in a far smaller device than traditional tokamak-based fusion reactors. In contrast to other companies' approaches, Helion's MIF uses the isotope Helium-3 as a fuel. Though rare on Earth, extensive deposits of HE-3 are located on the Moon. Helion has not made it clear whether it intends to relay on Earth He3 supplies or if Moon-based He3 is at all part of their efforts. New Jersey-based Lawrenceville Plasma Physics (LPP), is a group founded by plasma researcher Dr. Eric Lerner. LPP attracted global attention last year by running a high profile and successful Indiegogo campaign, which raised over $180,000 USD ($222,000 CDN) over two months. On May 21st , LPP announced that is was receiving an additional $200,000 USD ($246,000 CDN) from the Baltimore, MD-based Abell Foundation. LPP's efforts are centred around a device called the dense plasma focus (aka "focus fusion"). The dense plasma focus device consists of two cylindrical metal electrodes nested inside each other. The electrodes are enclosed in a vacuum chamber with a low pressure gas filling the space between them. A pulse of electricity from a capacitor bank is discharged across the electrodes. For a few millionths of a second, an intense current flows from the outer to the inner electrode through the gas. This current starts to heat the gas and creates an intense magnetic field. Guided by its own magnetic field, the current forms itself into a thin sheath of tiny filaments; little whirlwinds of hot, electrically-conducting gas called plasma. This sheath travels to the end of the inner electrode where the magnetic fields produced by the currents pinch and twist the plasma into a tiny, dense ball only a few thousandths of an inch across called a plasmoid. The magnetic fields very quickly collapse, and these changing magnetic fields induce an electric field which causes a beam of electrons to flow in one direction and a beam of ions – atoms that have lost electrons- in the other. The electron beam heats the plasmoid to extremely high temperatures (equivalent to billions of degrees C), triggering nuclear fusion. After decades of research and frustration at the slow progress in the fusion field, the private sector is supporting more unorthodox methods which stand a good chance of success in the near future. Government labs have shown that fusion power is possible. The private sector is now racing to make it efficient. While Canadian aerospace and space firms contribute useful amounts of research and development funding, this private sector money is normally bolstered with larger pots of Federal, provincial and academic funding. Below is the 2015 listing of some of the better recognized academic institutions and organizations for space and aerospace focused firms to collaborate with, learn from and maybe even hire a few of their graduates. The Association of Universities and Colleges (AUCC) - As the "voice of Canadian universities," at least according to their website, the AUCC is a useful first stop when building an inventory of Canadian educational facilities focused on science, engineering, space activities or anything else. According to the AUCC, "Canadian universities educate more than 1.5 million students annually. They perform more than one-third of Canada’s research and development. And, as a $30 billion enterprise, our universities generate economic wealth in communities across Canada." AUCC also publishes the annual "Directory of Canadian Universities," the 2014 edition of which lists "97 universities and university degree level colleges in a consistent, indexed format." The Canadian Universities Website - A useful overview of academic expertise in this area covering universities and colleges from the self-proclaimed "Canada's higher education and career guide." Of particular note is the listing of Space Science Scholarships in Canada although other academic sectors can also be accessed from the search page. The Canada's Top 50 Research Colleges List - An annually updated listing of Canada's top research colleges tracked by amounts spent and areas of expertise. Designed to educate those who believe that the only true research is done in universities. Canadore College - The Canadore College School of Aviation Technology, located at Jack Garland Airport, recently began construction of a new Advanced Composites Fabrication, Repair and Test Centre (ARC-TC) and continues to perform tests on a mock-up of the proposed SOAR suborbital space plane for European based Swiss Space Systems (S3) as part of Federal MP Jay Aspin's plan to turn the sleepy community college into an international high tech business hub. Carleton University - The Carleton Department of Mechanical and Aerospace Engineering is the home of the Carleton Mechanical and Aerospace Society (CMAS) and the CU3SAT micro-satellite project, which competed in the 2012 Canadian Satellite Design Challenge (CSDC). A second team from Carleton competed in the 2014 CSDC. Centennial College - The Centennial College Centre of Aerospace Training and Education (CATE) provides several post-secondary, apprenticeship, corporate and secondary school co-operative programs in aerospace manufacturing and support. The facility received $26Mln CDN from the Ontario government to relocate these programs to the former de Havilland aircraft manufacturing centre at Downsview Park, in June 2014. The new facility will be part of a larger aerospace training and research hub being developed for the commercialization of new technologies. Laurentian University – In partnership with Science North, Laurentian offers the comprehensive Science Communication graduate program, which covers "the theory underlying good communication as well as the practical challenges of effectively communicating science and the issues involving science in society." Polytechnics Canada - The "voice of leading research-intensive, publicly funded colleges and institutes of technology." Strong advocate for moving at least some of the government money focused on R&D out of universities and into community colleges and trade schools. Royal Military College (RMC) - The Department of Space Science program at RMC offers both undergraduate and graduate programs with specialization focused around theoretical, experimental and observational aspects of space science: from space mission analysis, mission and payload design, remote sensing, satellite tracking, ionospheric physics and space weather, and astronomy and astrophysics. The University of Alberta - Home to both the Centre for Earth Observation Sciences (CEOS), which uses Earth observation and imaging technology to monitor environmental changes, manage resources and formulate sustainable development policies, and the Institute for Space Science, Exploration and Technology (ISSET), a pioneering interdisciplinary centre for planetary and space research. The university also hosts the annual Canada-Norway Student Sounding Rocket (CaNoRock) exchange program and is home to the AlbertaSat team, which competed in the 2012 and 2014 Canadian Satellite Design Challenge. The University of Calgary - Home of the Institute for Space Research, which is part of the Department of Physics and focused on the areas of space plasma, aural imaging and analysis and modeling. 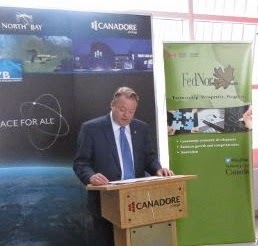 Projects include the Enhanced Polar Outflow Probe (e-POP), a scientific payload for the CAScade, Smallsat and IOnospheric Polar Explorer (CASSIOPE), satellite, a scientific mission focused on telecommunications advances and solar weather research funded by the Canadian Space Agency (CSA) as part of the Technology Partnerships Canada program with MacDonald Dettwiler (MDA). A team from the University of Calgary also competed in the 2014 Canadian Satellite Design Challenge. The University of Manitoba - Home of the University of Manitoba Space Applications and Technology Society (UMSATS), which competed in the 2012 and 2014 Canadian Satellite Design Challenge. As outlined in the March 4th, 2015 UM Today article, "Partners in space, U of M and Magellan Aerospace to build satellites," the university is also home to a new Advanced Satellite Integration Facility, a 6,000-square-foot area, large enough to accommodate up to three satellites at various stages of assembly, plus an ISO Class 8 clean room facility to satisfy the requirements of current and future Canadian government satellite programs. The satellites comprising the RADARSAT Constellation Mission (RCM) are expected to be built in this facility. The University of Saskatchewan - Home of the University of Saskatchewan Space Design Team (USST), a student run organization which dominated the 2011 NASA sponsored Space Elevator Games and competed in the 2012 Canadian Satellite Design Challenge (CSDC), plus the University of Saskatchewan Institute of Space and Atmospheric Studies (ISAS). ISAS maintains strong links to the Canadian Space Agency (CSA) through various contributions to the Canadian Optical Spectrograph and InfraRed Imager System (OSIRIS) for the Swedish ODIN satellite, the Time History of Events and Macroscale Interactions during Substorms (THEMIS) mission, the various Canadian Geo-space Monitoring (CGSM) programs and the Canadian Network for the Detection of Atmospheric Change (CANDAC) plus international research connections through the Climate And Weather of the Sun-Earth System (CAWSES) program, the Super Dual Auroral Radar Network (SuperDARN) and the Advanced Modular Incoherent Scatter Radar (AMISR) program. The University of Toronto - Home to both the University of Toronto Institute for Aerospace Studies (UTIAS) Space Flight Laboratory (SFL), the first Canadian academic institution able to build low cost spacecraft, micro-satellites and nano-satellites, and the Canadian Institute for Theoretical Astrophysics (CITA). As the "big boy" of academic space activities in Canada, the UTIAS-SFL collaborates with business, government and academic institutions on the development of new space technologies and strengthening the Canadian skill base in space systems engineering. Recent UTIAS-SFL satellites have included the Brite Constellation of micro-satellites, AISSAT-2 (a follow-on from the very successful AISSAT-1) and the Maritime Monitoring and Messaging Microsatellite (M3MSat). The facility also has close relationships with the Canadian Space Agency (CSA), Bombardier, the NASA Ames Research Center, MacDonald Dettwiler (MDA) and multiple foreign governments. The University of Waterloo - Home of Canada's largest engineering faculty (divided up into several different schools and research centres, most notably Mechanical and Mechatronics Engineering), the university faculty has contributed to a variety of space focused projects. These include the Heterodyne Instrument for the Far Infrared (HIFI) instrument on the Herschel Space Observatory, the VASCULAR and BP-Reg medical experiments conducted in 2012-13 aboard the International Space Station (ISS) by Commander Chris Hadfield (who joined the Waterloo faculty in 2014) and a proposed micro-satellite mission (the Quantum EncrYption and Science Satellite or QEYSSat) that would demonstrate long-distance quantum key distribution from space. The university also hosts the Waterloo Space Society (WSS), which organizes and promotes space-related events at Waterloo and within the larger community. WSS has two active engineering sub-teams: WatSat which participated in the 2012 Canadian Satellite Design Challenge and the Waterloo Rocketry Team. The University of Western Ontario (UWO) – Home to the Canadian Lunar Research Network (now a part of the new Solar System Exploration Research Virtual Institute), the Centre for Planetary Science & Exploration (CPSX) and the co-host of the Canadian Astrobiology Network. UWO contains Canada's only graduate program in planetary science, with over 40 PhD and MSc students and a new undergraduate minor degree in planetary science and space exploration. The university can also boast of its role in development of the Near-Earth Object Surveillance Satellite (NEOSSAT), the Mars Science Laboratory (MSL), the proposed 2016 ExoMars Orbiter and EDM mission, plus the proposed ExoMars 2018 mission and has a close relationships with the Canadian Space Agency (CSA), the NASA Ames Research Center, MacDonald Dettwiler (MDA) and multiple foreign governments. York University - Home of the Lassonde School of Engineering, which includes the department of Earth and Space Science and Engineering and the Earth and Space Science graduate program.York scientists, engineers and students have contributed the Phoenix Scout Mission, SCISAT (the Canadian Space Agency mission to research the ozone layer) the Canadian Wind Imaging Interferometer (WINDII) on NASA’s Upper Atmosphere Research Satellite (UARS) and the Canadian Optical Spectrograph and InfraRed Imager System (OSIRIS) for the Swedish ODIN satellite. York is also home of the York University Rover Team. A research team working on a cosmic ray-detecting space telescope has announced their plans to use this tool to also detect orbital debris, as a prelude to testing a laser cannon on the International Space Station (ISS) designed to destroy space junk. The announcement interestingly parallels the US military's recent deployment of laser weapons for battlefield use. 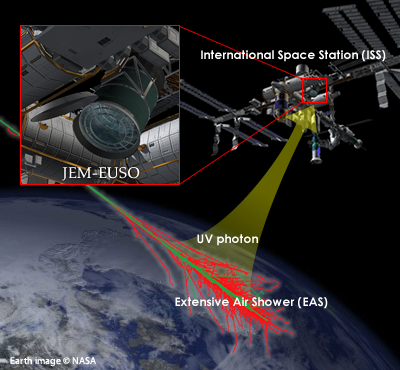 Graphic of JEM-EUSO on the ISS. The telescope, which is expected to be installed on the ISS in 2017, will observe brief flashes of light in the earth's atmosphere caused by particles arriving from deep space. Graphic c/o JEM-EUSO website. 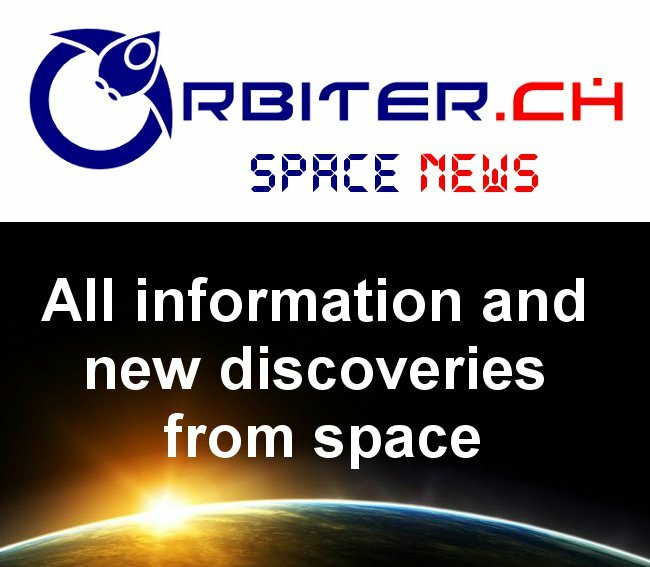 As outlined in the May 18th, 2015 DNews article, "Space Station Could Get Laser Cannon to Destroy Orbital Debris," the telescope, called the Extreme Universe Space Observatory (EUSO), is scheduled to be installed on the Japanese Experiment Module (also known as Kibo), of the ISS in 2017. EUSO will be a first-of-its-kind mission concept focused on investigating high-energy cosmic rays and neutrinos by observing the streaks of ultraviolet light produced when these particles interact with Earth's atmosphere. EUSO, in essence, uses Earth's atmosphere as a detector. 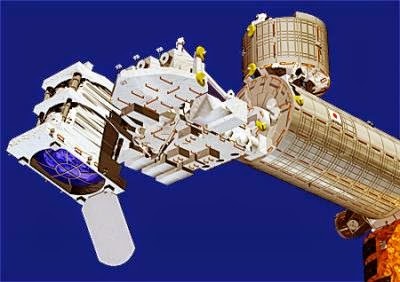 Originally a European Space Agency (ESA) mission design, EUSO was to be hosted as an external payload on the ESA's Columbus module on the ISS. Although an initial design study was completed, the ESA decided in 2004 not to proceed with the mission due to financial constraints. EUSO was then re-tasked as a payload to be hosted on board the Kibo module and the mission was renamed JEM-EUSO. The Extreme Universe Space Observatory telescope. The telescope is a fast, highly-pixelized, large-aperture and large field-of-view digital camera, working in the near-UV wavelength range (330÷400 nm) with single photon counting capability. Graphic c/o JEM-EUSO in the USA. In the April 30th, 2015 Space.com article, "Space Station Could Get Laser Cannon to Destroy Orbital Debris," Toshikazu Ebisuzaki, an astrophysicist at the RIKEN Institute in Wako, Japan (one of the institutions taking part in EUSO), said that a team at RIKEN believe that EUSO could be used for space junk detection in addition to its cosmic ray work. Once space junk is detected by EUSO, the RIKEN scientists have proposed using a coherent amplification network (CAN) laser to destroy it. A CAN laser utilizes many small lasers working together to generate a single powerful beam. This type of laser is currently being developed to drive particles to high speeds in particle accelerators. The RIKEN scientists propose using the CAN laser to vaporize a thin layer off the surface of space debris. This vaporized layer would become a high-speed plasma (superhot gas) that would act like rocket exhaust, pushing the space junk away from the ISS to eventually burn up in Earth's atmosphere. A full-scale version of their system would be armed with a 100,000-watt ultraviolet CAN laser that can fire 10,000 pulses per second, each pulse lasting one-tenth of one-billionth of a second. The RIKEN team says this system could have a range of about 100 km. The CAN laser would require about 8 kg of lithium-ion batteries. They plan to deploy a small proof-of-concept version of their system at the ISS. This would consist of a miniature version of EUSO and a prototype 10-watt ultraviolet CAN laser firing 100 pulses per second. A RIKEN spokesman stated that the mini-EUSO telescope has been accepted as a project on the ISS and could perhaps be installed in 2017 or 2018, but the laser system has yet to be built. Should the proof-of-concept and full-scale versions succeed, the RIKEN researchers suggest developing a satellite devoted solely to destroying space debris. They propose that the satellite could be placed into an orbit that traverses both of Earth's poles, enabling it to destroy debris all around the planet, and be armed with a 500,000-watt ultraviolet CAN laser able to fire 50,000 pulses per second. The researchers estimate that such a satellite could destroy one piece of debris every five minutes, or 100,000 pieces of space junk in a year. Such a system would be a powerful weapon against the increasing threat of space junk. The U.S. Navy Afloat Forward Staging Base (Interim) USS Ponce (AFSB(I)-15) with the Office of Naval Research (ONR)-sponsored Laser Weapon System (LaWS). The system was installed just prior to it's most recent deployment to the Arabian Gulf. in November 2014. US Navy photo c/o John Williams. In November 2014, the US Navy deployed its first operational laser cannon in the field. The 30-kilowatt Laser Weapon System (LaWS) was installed on the amphibious transport ship USS Ponce and run through various tests, including destroying target ships and drones. The US Navy sees laser weapons as having major advantages over projectile ones, including a much lower cost per shot, no reload time, and no risk of running out of ammunition. Although currently limited to defending against close-in targets due to limited power and a slow targeting system, the US Navy intends for next-generation LaWS to replace projectile-based systems like the Phalanx CIWS for defence against missiles and aircraft. Laser weapons, long a science fiction staple, are now entering the realm of science fact. Also as in science fiction, they serve as instruments of both war and peace. The 2015 Edition of "Jobs, Jobs, Jobs in Space!"